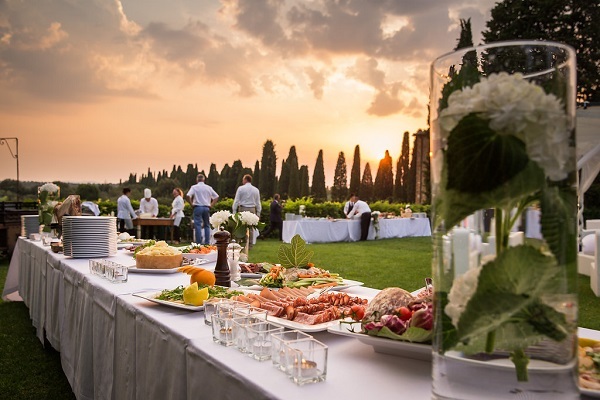 If you dream of a civil wedding that combines luxury, elegance and Italian charm the Italian Riviera is the perfect for wedding location. Known as the Italian Riviera, the Ligurian coast runs along the Mediterranean Sea from the border of Tuscany to the French border and attracts with idyllic bays, romantic beaches and beautiful seaside villages. The Italian Riviera is divided into two sections – the Riviera di Levante is called the section between Tuscany and the huge Italian port city of Genoa and the Riviera di Ponente refers to the coastal strip between Genoa and France. The very mild climate provides ideal conditions for weddings from April to October. The nobel towns of Portofino and Santa Margherita have many luxury hotels, stylish restaurants and elegant villas and allows luxurious wedding receptions. For more native Italian weddings, the famous fishing villages of the Cinque Terre on the Riviera di Levante offer the perfect backdrop. Beautiful churches, gardens with large palm trees, flowering oleander and bougainvillea and noble villas, rustic trattoria or stately castles make Portofino, Portovenere, Vernazza, Monterosso & co the perfect wedding locations on the Mediterranean sea in Italy. In addition, the picturesque bay of the Gulf of Poets with the idyllic harbor town of Lerici, the fishing village of San Terenzo or Tellaro is our tip for an unforgettable wedding in Italy. Enjoy your dream wedding under a bright blue sky and with a breathtaking view over the azure sea on the Italian Riviera.